May 30th, 2012 by Simon E.
With the AVChat Integration Kit for IP.Board you can instantly increase member sign ups and retention. Visitors can log in using their existing Facebook and Twitter accounts. The chat will show their FB/Twitter avatar, username and profile link. Once inside, these visitors will also be able to invite their Facebook/Twitter friends to join the chat. AVChat pays for itself! It can generate real revenue from new ads, affiliate links and membership plans. Gartner predicts social media revenue will reach $34 billion by 2016, up from $11.8 billion in 2011. Add Google AdSense to the chat page and profile pages of your members and start earning real cash from your new website. 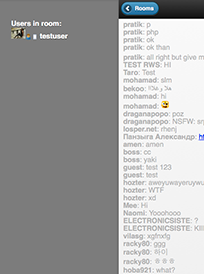 The chat will also generate new page views for your member profile pages. AVChat - or just some of it’s features - can be configured to be available only to premium member levels thus encouraging regular members and visitors to subscribe to your premium membership plan. 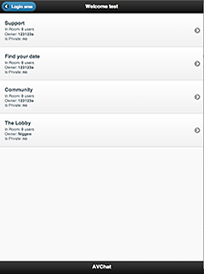 Keep your Drupal members connected on the go with mobile rooms, mobile text chat and mobile users list. The login screen is the 1st screen a mobile member will see. With the Drupal Module the username will already be filled with the members details. The rooms screen allows you to view and join public rooms and how many people are in them. The text chat is the main screen of the mobile version. It allows you to chat in real time with other people connected via mobile or desktop. The text chat supports emote icons. The users list shows you who is in chat, their avatar, weather or not they have a web cams and if they're on a desktop or mobile device. The AVChat Module for Drupal ($49) handles the integration between your Drupal website and AVChat. Members will have the same username and gender in the website and in the video chat. Double login is not needed. The profile photos from JomSocial or Community Builder are automatically used for the users list and text chat inside the video chat. Control more than 15 permissions - including chat access, video chat, private messages, room creation, file sharing - for each member level in particular. 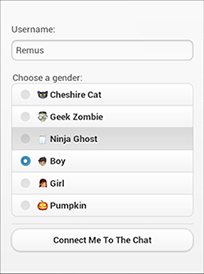 View more info about the chat members by accessing their profile page directly from the chat. You can allow trusted member levels to moderate rooms, become invisible, kick, ban or view private messages and streams. All the important chat options are available int the Drupal backend where they're easy to access and configure. Create a social network on your own server. Download the Drupal source code and make any custom changes you want. Pick from hundreds of third-party themes and plugins. Includes 100% source code access and data ownership. The code for the Drupal Module is licensed under GPL which means it's uncencrypted, you can study it, modify it and extend it to suit your needs. The AVChat Module for Drupal is one of our best integrations. It has member level permissions, easy access to AVChat settings in the Drupal backend, easy use. Purchase today for your Drupal website and start growing. Yes you can ask for a reund within 10 days of receiving the software. Yes, we provide a free installation with every purchase. Contact contact@avchat.net after purchase. Yes, you can upgrade at any time your AVChat license to accomodate for more online users. PayPal, Visa, MasterCard, Eurocard, American Express, Diners Club, Discover/Novus, Dankort /VISA, Postepay (Visa), JCB, Carte Bleue (BlueCard), Solo, Direct Debit, Wire / Bank Transfer, Check, Fax, Purchase Order, Alipay, sofortbanking, Giropay, iDeal, Webmoney, PayNearMe, Boleto Bancario (Brazil), CashU, Ukash, IPS, Konbini (Japan), Pago FÃ¡cil (Argentina) , Barcode Santander (Chile), QIWI. Where can I see the documentation? You can check our documentation right here.